A building that gives back to the environment. With day lighting in every room. With natural, breathable earth block walls. Where rain water runs from every faucet. and bacteria, instead of dumped into sewers. So sustainable that it actually gives back to the environment. In harmony with nature and bringing health to its occupants. The M.U.M. Sustainable Living Center will be the first of its kind. It is a building that is completely off the grid, surpasses LEED platinum, the highest LEED standard, and complies with the Cascadia Living Building Challenge. These are two of the most rigorous certifications for ecologically friendly buildings. Additionally the building will comply with Bau (or building) Biology, a German system that focuses on creating buildings that are healthy for the occupants. The M.U.M. Sustainable Living Center will be a classroom, workshop, and office building to serve the rapidly expanding Sustainable Living degree program at Maharishi University of Management. The vision for this center is that it will be a building that teaches, a building that utilizes the most practical green building techniques and show cases them through informative displays to students and visitors. This building goes beyond the usual concept of a green building which is measured primarily in terms of its carbon foot print. The SLC is actually beyond carbon neutral, creating more energy than it uses, but the building also offers much more. 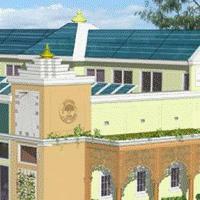 A unique feature of the SLC is that it is built in accordance with Maharishi Vastu Architecture, MVA is an ancient system of architecture which uses orientation, precise proportions, and specific placement of rooms. The entance of the building is to the East to take advantage of the enlivening rays of the early morning sun. Precise proportions are used to connect the built environment with the natural environment. Specific room placement harnesses the different qualites of sun light at different times of the day, to support different types of activity. This all creates a building which is in tune with nature. Prinicples from Maharishi Vastu Architecture, Building Biology, and guidelines from LEED and the Cascadia Living Building Challenge all come together to make this building functional, efficient, sustainable, pure, healthy, harmonious, and uplifting for everyone. "A building that teaches, that walks its talk": Plans for our new Sustainable Living Center, which will be a "living building." It goes beyond LEED Platinum Certification, giving back more power and water than it uses. call me when they actually BUILD this building! well great... then do it! All new technology is a process which is perfected over time. It takes TIME, dreaming, tweeking and new engineering insights to emerge. Renewable Energy Timeline K-12 Energy Education Program Renewable Energy has been used throughout the world throughout time because of its convenience and availability. This timeline shows events and product discoveries relating to renewable energy. An activity follows that you are able to do with your students called Over the Years. (B.C.E.=Before Current Era) Go to the Department of Energy Renewable Energy Timelines which include separate timelines for biomass, ethanol, geothermal, solar, photovoltaics, solar thermal, solar water heating, and wind. 400 B.C.E. : Socrates promotes passive solar design for comfortable living. Ancient Greeks use the sun's position in the sky to heat their homes in winter and keep them cool in summer. The open front of a Greek house faces south. Winter sunshine fills the house and warms the air inside the earth floor and thick walls. At night, the warm floor and walls continue to radiate heat and keep the temperature comfortable. The Greeks build porticos, or covered porches, over the front of their houses. The roof of the portico blocks the rays of the summer sun. The house stays cool inside. 200-300 B.C.E: A Greek mathematician shows that a reflective surface shaped like a parabola can concentrate sunlight to a point. Ancient Greeks, Romans, and Chinese use these early solar concentrators to light fires, especially in relationship to lighting spiritual fires. 700s: In Sri Lanka, the wind was used to smelt metal from rock ore. 950s: In Persia, windmills ground corn into corn meal. These were vertical axis wind machines that had shelters built around the blades to force wind in. 1200: In Europe, the horizontal axis postmill was built and used. 1200s: The armies of Genghis Khan brought Persians to China to build windmills for irrigation. 1300: In Europe, the mock mill was built where only the top part of the building has to be moved to change direction of machine. 1500: In Spain, tower windmills with triangle shaped cloth sails were used. 1500s: Leonardo da Vinci proposes the first industrial applications of solar concentrators. 1600: In the Netherlands, drainage windmills move water out of lowlands into dike systems. 1600: Drainage windmills turn fens (wetlands) into farmland. 1600s: The Protestant Reformation in the Netherlands used windmill blade positions to indicate a safe place for Catholics. 1626: The Dutch purchase New Amsterdam (Manhattan Island) and bring their windmills to America. 1693: Under new Dutch law, each windmill must have a name. 1700: The Netherlands and England each had approximately 10,000 windmills. 1745: Fantail was invented in England where blades move into the wind. 1759: In England, blades were turned 20 degrees to get more power from the wind. 1767: Swiss scientist Horace de Saussure invents the world's first solar collector, or "solar hot box." 1784: An official city seal was designed for New York City, NY which featured windmill blades. 1805: Sir Francis Beaufort created a wind speed chart (41.22 KB) based on observations in England. 1806: The French Army invaded the Netherlands and saw hundreds of mills along the Zaan River. 1839: French scientist Edmund Becquerel first observes the photovoltaic effect. Becquerel experimented with two identical electrodes in a conducting solution, converting light directly into electrical current. 1850s: An inventor named Daniel Halladay of Connecticut worked with John Burnham to build and sell the Halladay Windmill which was designed for the American West with an open tower design and thin wooden blades. They also started the U.S. Wind Engine Company. 1861: French Scientist Augustin Mouchot patents a solar engine. 1865: At the end of the Civil War, everyone moved west. Railroads purchased the two newly designed windmills to pump water for the steam engines. 1867: Leonard Wheeler of Beloit, WI created the Eclipse windmill, also for the American West, and started the Eclipse Wind Engine Company. 1880s: American engineer John Ericsson launches the solar energy industry in the U.S. Ericsson develops several solar-driven engines to power steam generators for ships. 1880s: Western homesteaders purchase windmills from catalogs, traveling salesman or they build their own. Mills were used to pump water, shell corn, saw wood, and mill grain. 1880s: Thomas O. Perry conducted over 5,000 wind experiments trying to build a better windmill. He invented the mathematical windmill and starts the Aermotor company with LaVerne Noyes. 1882: The world's first hydroelectric power station (Vulcan Street Power Plant) was built in Appleton, Wisconsin. 1889: 77 windmill companies are in existence in the United States. 1891: Father of solar energy in the U.S., Clarence Kemp, patents first solar water heater. 1890s: First commercially available (roof mounted) solar water heaters are produced in southern California. 1892: Poul LaCour used a windmill to generate electricity in Denmark. 1893: In Chicago, IL, the World's Columbian Exposition (a huge technology expo), highlight 15 windmill companies who showcase their goods along with steam engines and Thomas Edison's talking films. 1894: Explorer Fridtjof Nansen used windmill powered lights in his ship's cabin while searching for the North Pole. Early 1900s: Wind mills pump saltwater to evaporate ponds to provide California gold miners with salt. 1908: 72 windmills provide electricity to a village in Denmark. 1908: William J. Bailey of the Carnegie Steel Company invents solar collectors that became predecessors of today's solar collectors. 1920-50s: South Florida develops as a significant market for solar water heaters (thermosiphon design). Several companies service a market of about 50,000 homes. The industry virtually expires in 1950s, unable to compete against cheap and readily available natural gas and electric service. 1930s: Rear Admiral Richard Byrd brought a Jacobs wind generator to the Antarctic where it ran for 22 years without repairs. 1937: Jacobs Wind Electric Company opened and began selling windmills and generators (Marcellus Jacobs). 1939: The Dutch communicate with Germans via windmill blade position. 1940s: 'Solar Homes' become popular. More builders consider active and passive solar housing design. 1940s: During World War II, the Dutch found and rescued American pilots due to wind mill blade position. 1941: The biggest windmill ever installed is erected in Vermont with 53 meter blades. This wind turbine was the Smith-Putnam wind turbine. 1941: Over 60,000 solar water heaters in place in America. 1943: A part of the Smith-Putnam wind turbine breaks and the machine is shut down. 1945: The Smith-Putnam machine is restarted but due to small cracks in the blade, one blade broke and the turbine was shut down forever. 1950s: Most windmill companies were out of business in the United States. 1950s: Photovoltaic cells are used to power U.S. space satellites. 1954: Bell Telephone researches the sensitivity of a properly prepared silicon wafer to sunlight. The 'solar cell' is developed. 1960: First solar powered, 2-way radio, coast-to-coast conversation takes place between the U.S. Army Signal Corps in New Jersey and California. 1970s: There is again interest in wind power in the United States and Europe due to the oil embargo. 1973: Spurred by the first oil embargo, interest in terrestrial applications of photovoltaics blossoms. 1974: More than 20 companies start production of flat plate solar collectors in the U.S. 1979: Second oil embargo strengthens solar industry. 1980s: Wind farms are developed for large scale production in the United States and Europe. 1980: First solar cell power plant dedicated at Natural Bridges National Monument, Utah. 1980: Carlisle residence, featuring the first building-integrated photovoltaic system, passive solar heating and cooling, superinsulation, internal thermal mass, earth sheltering, daylighting, a roof-integrated solar thermal system, and a 7.5-peak-watt photovoltaic array of polycrystalline modules is completed. 1990s: Minnesota led the nation in new wind power capacity installed throughout the 1990's. Today: Photovoltaic cells continue to be the major power source for U.S. space projects. > well great... then do it! They are builing it - Just do a YouTube search and you can see the progress. Great post, I really enjoyed it. A truly "living" building. Sounds like a vision in concert with the awesome series of books out of Oregon; some of the best books I've read. Period. and there's a third, called The Oregon Experiment. of The Timelss Way.., and immediately was able to start drawing a plan for a living place, that married the inner and outer. windows on two sides of every room. Aha! It's just what I had always thought...but was led to bleive by others it was simply absurd, and that my wishes and visions were unreasonable. And perfectionistic. I do wonder about the rainwater--these days--hope it's filtered. Its wonderful to see such an integrated system being designed and built. This is an example of what can be done when people choose a new way of thinking. Although I would love to be able to live in a purpose built building like this, (ahhhh I can dream), there is nothing stopping any of us from applying ideas to our own homes, that are inspired by great projects like this. Over the last year, I have managed to halve my water, power and fuel usage, (and costs), with some very simple ideas. The money I save will go towards an electric car. These savings have made no noticeable change to my lifestyle, they have not been a hardship at all. Its just a matter of changing the way we think about the resources we use.